In a clear indication that it was jolted by Wednesday’s claim by a Niger Delta militant group that some Generals have been plotting to overthrow President Muhammadu Buhari government, Nigerian military authorities issued has issued another statement in less than 24 hours, assuring all political leaders and Nigerians in general that it will continue to support the development of the country’s democracy. 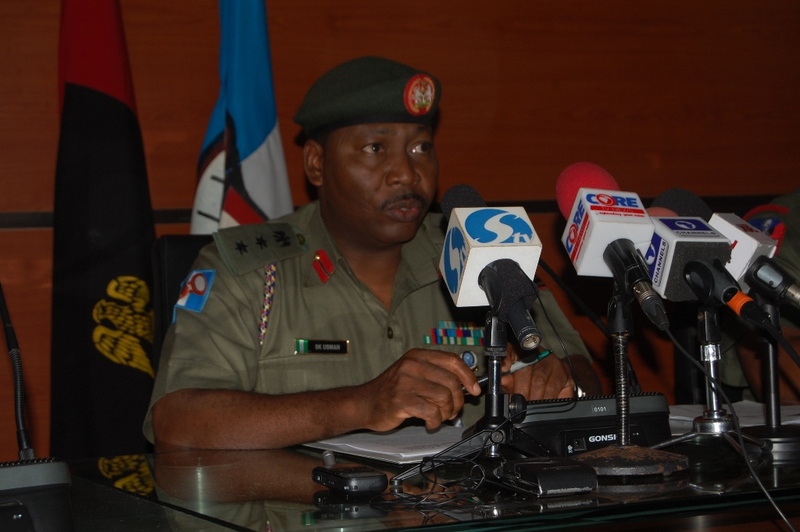 The statement was signed by Brigadier General Rabe Abubakar, Director of Defence Information. Colonel Sani Usman, acting director, public relations, Nigerian Army had early on Thursday morning issued a statement denouncing the claim of the group which identified itself as Joint Niger Delta Liberation Front, JNDLF. The group recently made futile threats to launch missile attacks against Aso Rock presidential villa and other key facilities in different parts of Nigeria. In a statement yesterday, it claimed some top military officers had approached it to help overthrow the Buhari government by sustaining ongoing attacks on oil installations across the Niger Delta. The group claimed the “coup plotters” whose names it did not disclose, said they wanted to use sustained attacks on oil facilities as a genuine reason to take over the government. Colonel Usman had in the earlier statement described the claims of the group as patently false, assuring that there was no plot to overthrow the President. In its own reaction, the Defence Headquarters which coordinates the activities of the three services- the Army, Air Force and the Navy also decribed the claim by JNDLF as “not only baseless and misleading but a dream of those who do not wish the nation well. The statement quoted the Chief of Defence Staff, General Gabriel Olonisakin as assuring the citizens of military’s commitment to development of Nigeria’s democracy and continued subordination to civil authority. The Defence Headquarters further described the coup allegation as “blackmail and distractions from fifth columnist,” in a statement signed by Brig.Gen Abubakar. The attention of the Defence Headquarters has been drawn to an online publications that the military intends to overthrow the civilian administration of President Mohammed Buhari. This report to say the least is not only baseless and misleading but a dream of those who do not wish the nation well. The story which was attributed to some Niger Delta militants was concocted to achieve cheap publicity and a complete propaganda and diversionary. The entire Nigerian Armed Forces therefore distant itself from this story as it is not only mischievous and baseless but with the intent to heat up the polity and cause public apprehension. The Chief of Defence Staff, General Gabriel Olonisakin wishes to assure our highly respected political leaders and the entire Nigerians that the military will continue to be apolitical and will do everything possible to defend and deepen our democratic governance which is the best, acceptable and legitimate form of government the world over. The Defence Headquarters restates its total subordination to civil authority and upholding the supremacy of the Constitution of the Federal Republic of Nigeria and will continue to defend all democratic structures and will never yield to blackmail and distractions from fifth columnist. Therefore this unfounded story should be discountenance in its entirety. In dealing with the myriad of security challenges across the country, the military will continue to remain focus and deploy every available resources to reposition our forces to carry out their constitutional roles.